Taking the fishing world by storm, the Lazer Trokar TK130 Flippin' Hooks are perfectly engineered for flippin' and pitchin' presentations, delivering maximum penetration and strength for a significantly better catch ratio. 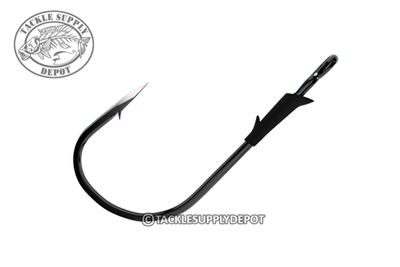 A serious flipping hook designed for serious flippers. The Lazer Trokar TK130 Flippin Hooks feature Trokar's unique surgically sharpened three-sided hook points - making them twice as sharp as any other hook on the market requiring half the pressure for penetration compared to others on the market. This patent-pending process precisely grinds the three sides of the hook point using a high-speed, computerized grinder designed for surgical needles. Lazer Trokar also determined the precise angle of the Low-Profile Barb using highly specific geometric calculations to provide easier penetration and the ultimate in holding power. In addition, Trokar bolstered the wire diameter of the hook and used a unique tempering process, specifically tailored to bring out the maximum strength potential of the ultra-high carbon steel Q741 wire. The result is a stouter hook that allows for aggressive hook-sets and intense fights, as well as, just the right amount of flex to resist breaking.